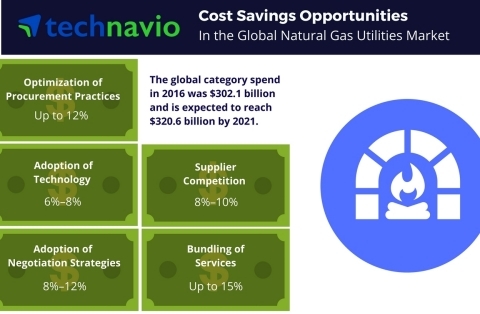 According to the latest procurement intelligence report from Technavio, the global natural gas utilities market is expected to grow at a CAGR of 1.2% over the next five years due to the growing preference for cleaner fuel alternatives. The research report titled ‘Global Natural Gas Utilities Market: Procurement Market Intelligence Report 2017-2021’ provides an in-depth analysis of category spend, best procurement practices and cost saving opportunities, aimed at helping organizations achieve superior business performance. The report also provides insights on pricing, supplier positioning, and top companies, enabling sourcing professionals to improve their competitive advantage through procurement excellence. “Innovations in drilling techniques, such as advanced hydraulic fracturing, have led to an increase in the supply of natural gas and dip in natural gas prices,” says lead Technavio procurement specialist Angad Singh for category spend intelligence. “Suppliers are increasingly adopting innovative technologies such as SCADA, AMI, EFM pertaining to aspects such as metering, distribution, transportation, and transmission,” adds Angad. The adoption of various cost-optimization levers helps buyers of natural gas utilities realize direct cost savings and enhance category management and value benefits (including reduced procurement complexities). The implementation of new technology such as SCADA to check leakage and damage in pipelines, advanced metering technology to streamline the billing procedure, and corrosion control technology to mitigate the distribution issues by suppliers enables buyers to save up to 8% of the total category spend. Buyers can considerably reduce transportation costs and procurement and delivery timelines by engaging with regional suppliers. Also, they can gain from the technological expertise of global suppliers by engaging with them. Hence, buyers should opt for an optimum mix of regional and global suppliers. Suppliers providing long-term agreements of fixed price with provision to opt for additional supply during peak hours along with the integration of supply with services is an important bundling strategy. The bundling of services can save up to 15% of the bundled spend area and increase the market foothold of the suppliers.